"Facing the promise of execution if they do not embrace Islam or pay tribute for being Christians, the remaining Christians in Mosul, Iraq fled before the deadline of noon on Saturday, July 19. "... On Friday, July 18, an 1,800-year-old church was set aflame, even as the remaining Christians attempted to evacuate the city before the deadline set for them to flee or face death expired." "[My friend, Michael LaCivita,] dared not say much, but he related this from the Syrian Maronite Bishop Sleiman, a sense of things as they are: 'Flattened. Everything is just flattened. Destroyed.' People's spirits are crushed; they have nothing, and are wholly dependent on aid; they are displaced, and in shock, and without the will to engage in the difficult work of surviving." A day of fasting and prayer is being promoted via social media for this Friday, 25 July 2014. If you'd like an already-composed prayer to use, this is a good one. DONATE to the Catholic Near East Welfare Association (CNEWA): "Support the brave priests, nuns and brothers -- CNEWA's partners -- who are on the ground and ready to care for the injured, the orphans and the frightened refugees." CONTACT your elected officials and urge them to speak out. There's also a petition on Whitehouse.gov you can sign. 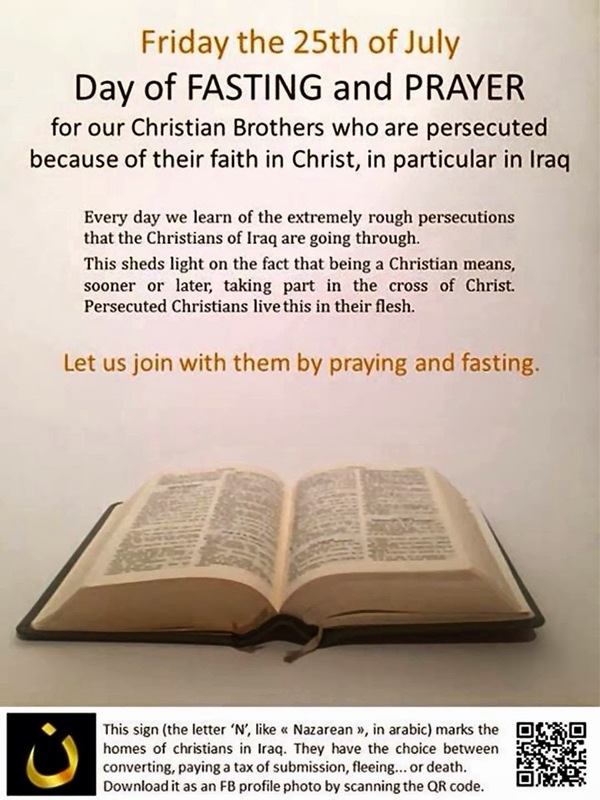 SHARE the news about what's happening in Iraq -- as the mainstream media is mostly silent (what a shock) -- and SPREAD THE WORD about the day of fasting and prayer for this Friday. The following graphic is a good one to use (click for full-sized).